When sensitive devices are connected to the output of a HVPS, such as a dielectric elastomer actuator, it can be desirable to limit the output voltage of the HVPS to prevent against a wrong manipulation on the front panel. 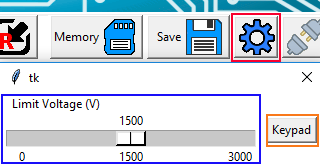 This can be done on the HVPS options dialogue, which you can access by clicking the tool button at the top right of the interface (red rectangle). In the displayed dialogue box, you can define a maximal voltage using the slider(blue rectangle), or the numerical keypad (orange rectangle). Then click on OK to close the option dialogue box. Then, as illustrated on the figure below, the upper bound of the voltage set point slider (red rectangle) is modified to the limit voltage you defined in the option dialogue box (in this case 1500V). If you are using the numerical input to set a voltage using the keypad, the voltage setpoint will be capped to the value you entered in the option dialogue box. When you define a limiting voltage, it will be enforced as soon as you close the dialogue box with ok. For example if the HVPS has a set point of 2.5kV with no safety limit, and a safety limit is then defined at 1.5kV, the set point and output voltage will be decreased to 1.5kV as soon as you press the ok button.